"The beautiful dome of this Baptist church is seen from all over Asheville. With our iconic city buildings behind the church this winter scene became my Christmas card design one year." The print will be shipped in a cardboard tube to ensure it arrives in great condition. Paper Size 11" x 14"
Image Size 10" x 13"
I've been wanting these forever. I'm a displaced Asheville-ian and having this above my mantle will be wonderful! Thanks! Asheville is one of our favorite places. 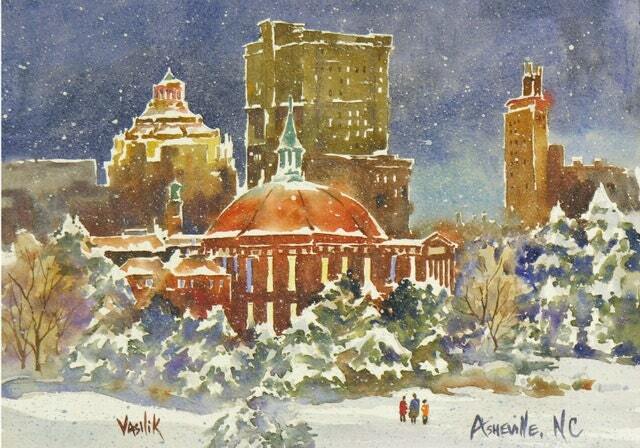 Ann Vasilik has been a favorite artist of mine for many years. She captures the spirit and beauty of the city in her work. I just love our print of Asheville, Land in the Sky. I have other prints from her collection as well. I have always had an excellent experience working with her. This is so beautiful and makes me homesick for Asheville! Thanks so much!